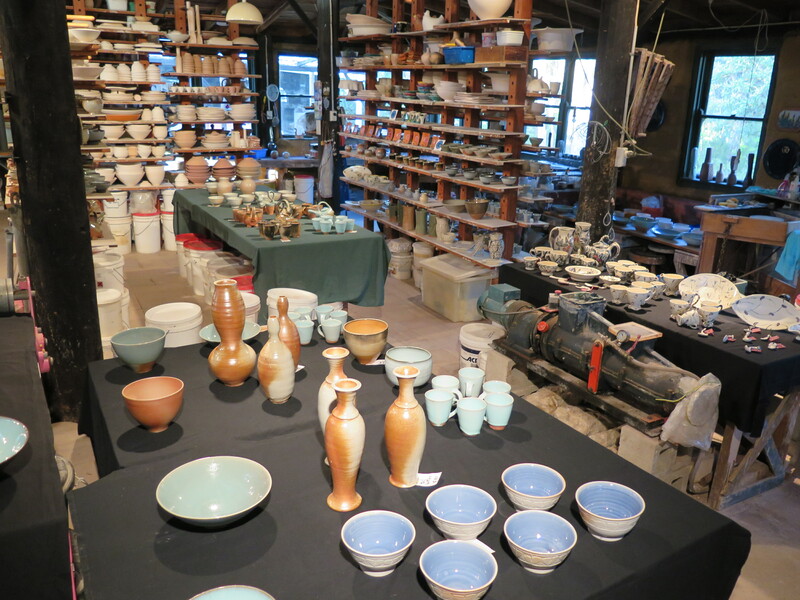 The first of our open studio weekends is over and we were quite busy all day, each day, with only one 10 minute gap between visitors all day each day. Not quite enough time to be able to make and eat a sandwich. We had to take it in turns to eat and go to the loo. Now that the pressure is off. 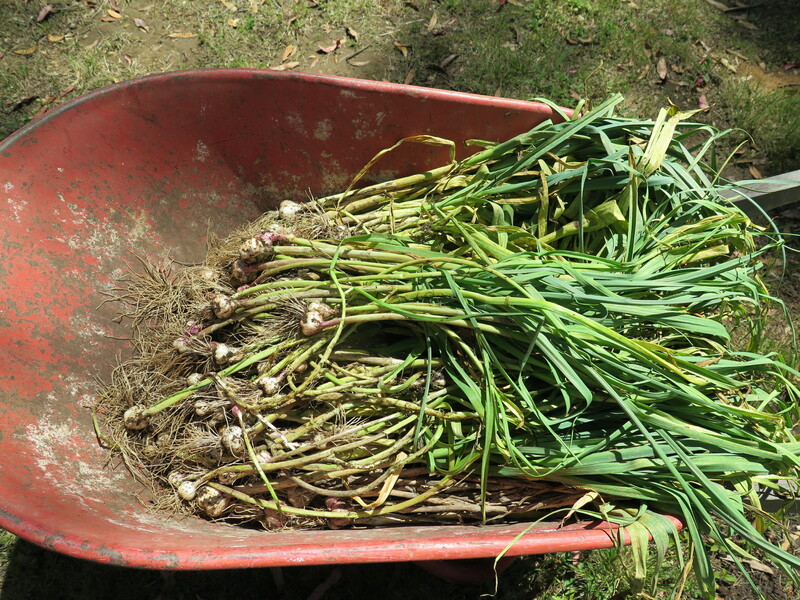 It is time to lift the garlic crop for this year. As I got them in early, they were ready to be lifted and dried a couple of weeks ago. Now is the first clear space I have had to be able to get into the garden and spend a couple of hours digging over the plot, weeding and sorting them all out. 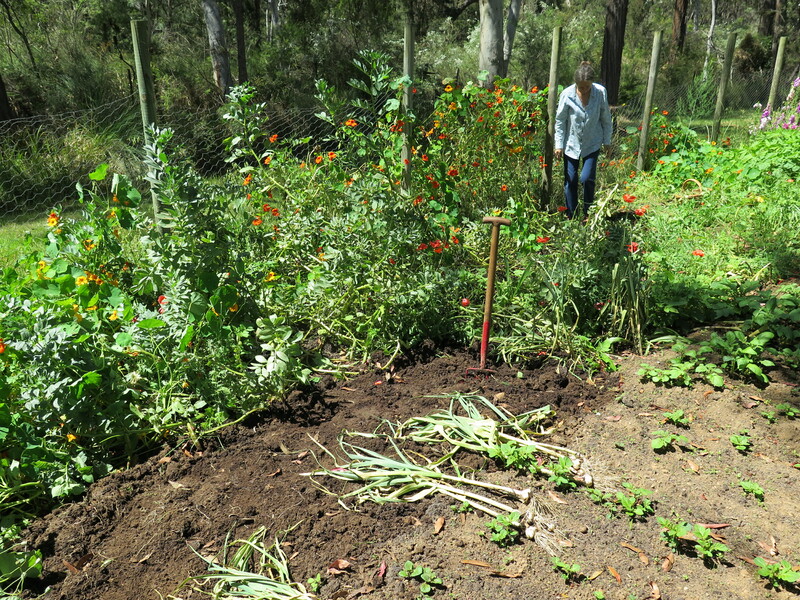 Janine had managed to get into the main garden last week and dig up the small plot that I planted out up there. I planted about 100 cloves from our larger knobs in the kitchen. A mix of all the different types that we have collected over the years. Red, white and pink varieties in both hard and soft stem types. She managed to find the time to preen them and spread them out to dry, before plaiting the largest of them and hanging them up on the kitchen wall by the wood stove chimney to finish drying. We have 3 plaits of about 15 knobs each. With another 50 smaller knobs all cleaned and dried and placed in a large colander on the kitchen bench top for immediate use over the next month or so. 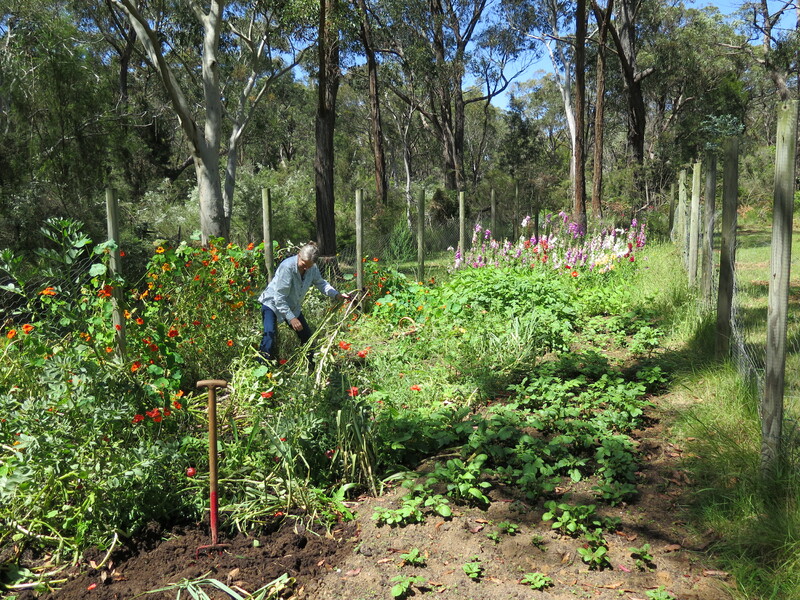 While I dig the garlic, The Lovely gets stuck in at the other end of the plot, up by the patch of English cottage garden flowers that I planted for her as a surprise 2 or 3 years ago. 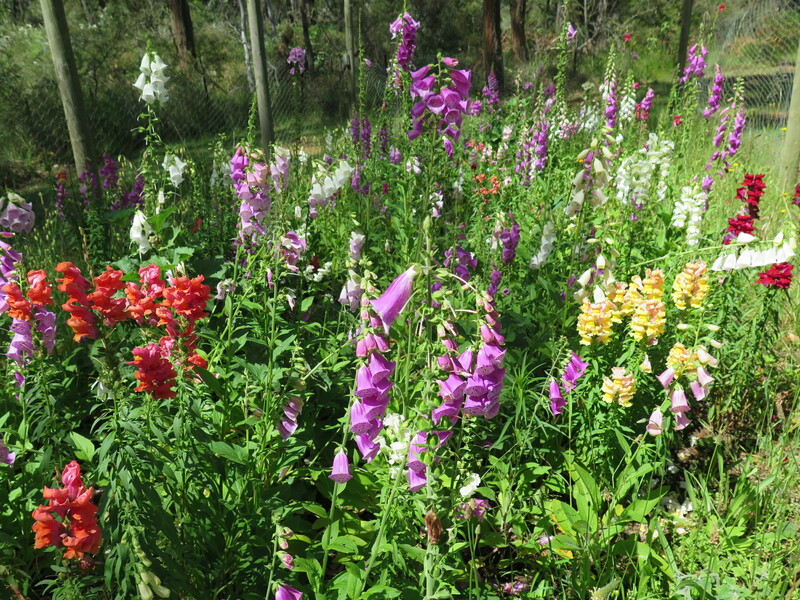 They take a while to get established, but are flowering well now. It bit past their best, but still lovely. A very nice back-drop to our work today. At some point in the future, I am going to reverse these two garden beds and lift all the cottage garden flowering plants and move them to the vegetable end, and vice versa. This will refresh the soil and the vegetables and flowers will both benefit from the change. Janine starts to harvest the last of the broad beans. Pulling out the spent plants as she finishes stripping the last of the beans off each one. It’s nice to be able to spend this time, working together in the garden. I bought half a dozen ‘new’, named varieties of organically grown garlic and planted them out in serried rows, down here in the Pantry Field garden. They had grown quite well, with some being obviously much stronger growers than others. I bought 3 knobs of each and planted out the individual cloves. These have now grown up into about 150 knobs of differing sizes. It would have been best if we had managed to find the time to harvest them a week or two ago. They had started to dry out and the tops had begun to lean over. Then we got so busy and it started to rain. We had 3 inches or 75 millimetres of rain last week and this was enough to reduce the dried tops to a liquid mush. The earliest varieties had lost their ‘paper’ coating and are starting to ‘burst’ or spread out. They’ll be fine for eating, but without any substantial stem. we won’t be able to plait them and hang them up. So more individual knobs for use directly from the bowl kitchen bench top. I’m not too sure how this will affect their ‘keeping’ capacity? We’ll find out during the coming year as this hasn’t happened before. I’m glad that we have had this fine, sunny day today, combined with a day ‘off’, so that we could get the crop in and start it drying out. There is a certain sense of achievement, satisfaction and security knowing that we have to years supply of garlic safely in hand. Some people have asked me what we do with so much garlic. Well, we eat it. We seem to get through the 200 to 300 small knobs pretty easily during the year. 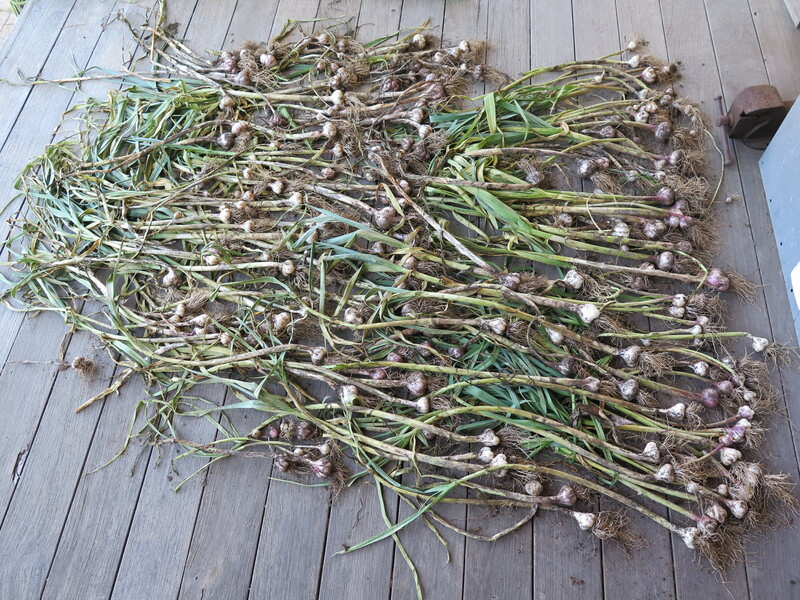 What we grow isn’t the largest or most presentable garlic. Not like what you might see for sale in the green grocers. But it is our own, organically home-grown produce, clean and free from any sprays, pesticides or preservatives. That is the kind of self-reliance that our enterprise here is all about, and a day ‘off’, spent in the garden is a good day indeed. This is fun for us. It doesn’t involve going out, driving anywhere, or spending any money. What more could you want? Our friend Annabelle Sloujetté has turned up from the south coast, bearing gifts of oysters and a couple of beautiful blackfish. 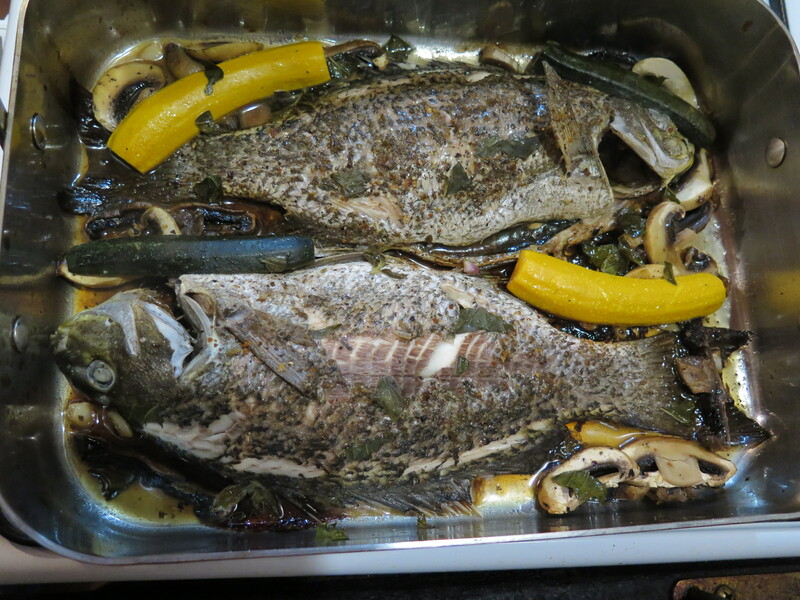 I steam them with some of our fresh little garlic cloves, a little olive oil, a couple of sliced large dark field mushrooms, two sliced zucchinis, some pepper and a squeeze of lemon juice. A splash of white wine finishes it off. 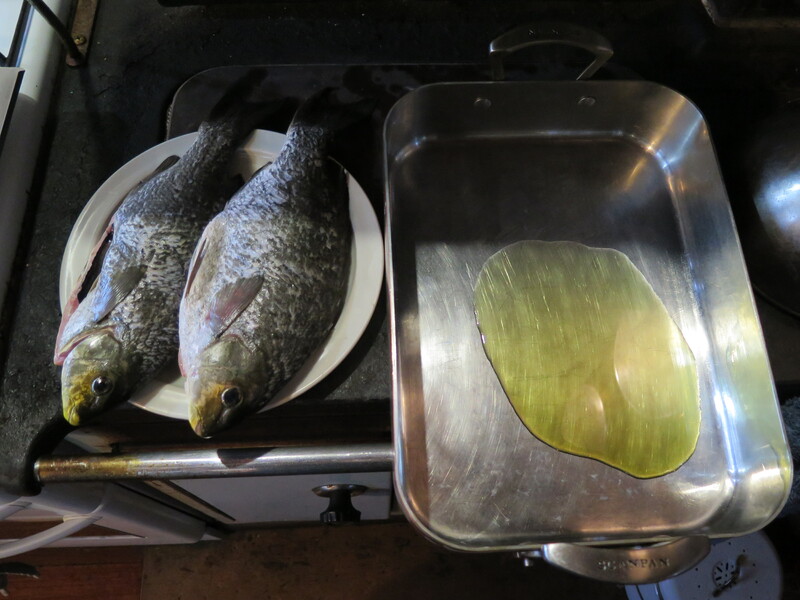 These fish are a really good size for blackfish, so I choose to cook them in the big rectangular copper baking pan, but it doesn’t have a lid. In the past I have used a sheet of al-foil to cover the pan on occasions, but I really don’t like to use aluminium cooking foil. It’s an environmental disaster, so we rarely use it. 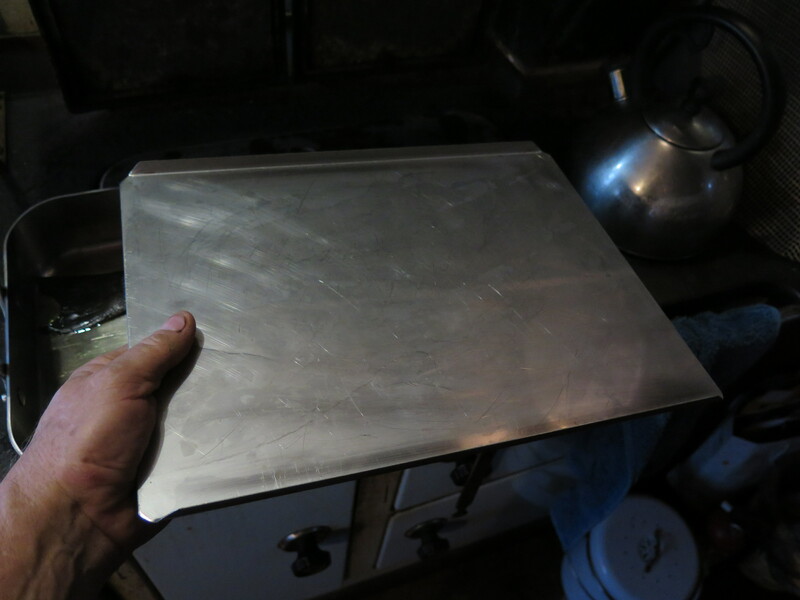 I decide to run down to the kiln shed and quickly make up a folded stainless steel, custom-made, lid for the pan. I’ve been meaning to do it for a long time now. So now is the time. I choose a small piece of stainless off-cut, that is almost the right size. 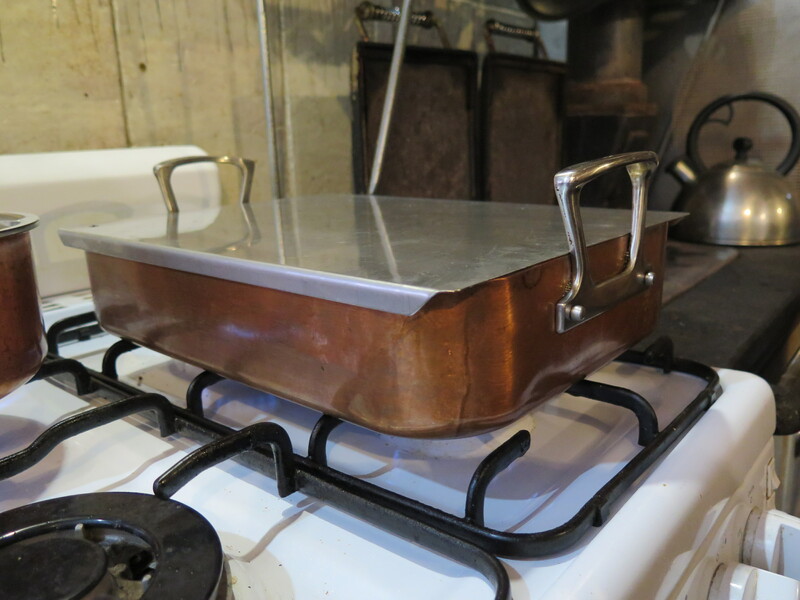 I measure it exactly and use the guillotine to slice off a few centimetres, I use the pan break to fold a slight return on two sides to help keep it flat when it is heated, then hand-file and smooth the edges. I measure it so that it will fit exactly between the two handles and sit snuggly on the flat rim. It takes me 7 1/2 minutes to get it done and I’m back in the kitchen before the others have finished cleaning the new potatoes that we harvested today along with the garlic and broad beans. I lift my hand to my face to wipe my brow after I have run back up from the workshop. Ah, Yes! I remember that smell. 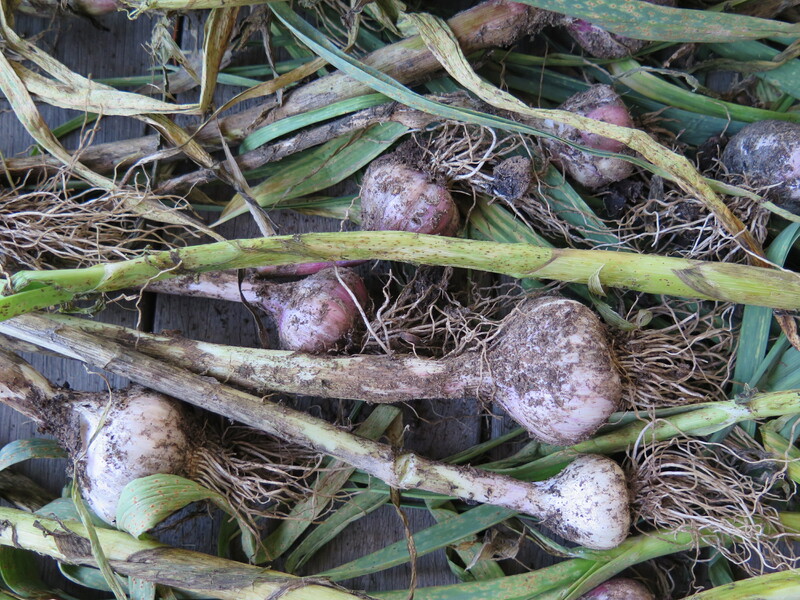 I have been digging and cleaning garlic all day, so tonight my fingers smell of garlic – again!